Many years ago, after hearing about "Crazy Otto", I've wanted the ROMset so that I could play it. Crazy Otto was a hack/modification that GenComp (General Computing/GCC, a group out of MIT) made. It was a board with a couple of roms that sat on a Pac-Man board, and gave the game a few updates; four maps, multicolor maps, smarter enemies, cut-scenes between some levels... If this sounds familiar, it should. After various events, Midway acquired it and it was rebadged as "Ms. Pac-Man". Mind you, it went through a few variations, namely Super Pac-Man, Pac-Woman, and Miss Pac-Man... more on those in another post. 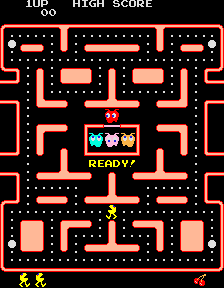 Pac Man scuttles about maze, eating dots. After seeing the material that has come to light, I now have to answer a few questions to understand where I'm going to take this project. Should I put some sort of watermark in the ROMS/on the screen to indicate this is a recreation? Which version of Otto should I reproduce? The earlier or the later version. Graphics-rom only hack, using Ms.Pac program roms. How accurate do I want to get? Should I make my graphics ROM identical to Otto, requiring more code hacks, or should I make it more convenient to implement, but less binary-accurate? Do I want to make it require bootleg hardware, or figure out shoving it into an authentic Ms.Pac board? 1. Yes. The program ROMs have an indication in them that this was a recreation made by me. On top of this, the startup routine displays a message stating which recreation it is, what date it was released on (as per Steve Golson's talk), and contact information for me. It also requires that the player press a button or move the joystick to proceed into the game itself. "OttoP2" 10/20/1981 - Ms. Pac-Man attract sequence, Midway copyright. "OttoP3" 10/29/1981 - Same as P2, but with a slightly different Midway copyright. "SuperP4G" 10/29/1981 - Same as P4M, but with Ghosts instead of monsters. All romsets were started with the graphics ROMs, adjusting animation sequences, sprite indexing, other patches to accomodate the layout of the graphics ROMs. It requires bootleg hardware. In MAME, it uses "mspacmab", the one with "boot1".."boot6" rom images.